Small to Large Cavity, Fractured/Cracked Tooth, Infected Tooth? We have many different restorative solutions at Fishinger Dental. Composite fillings are used to restore small to moderate sized cavities and minor fractures/cracks. 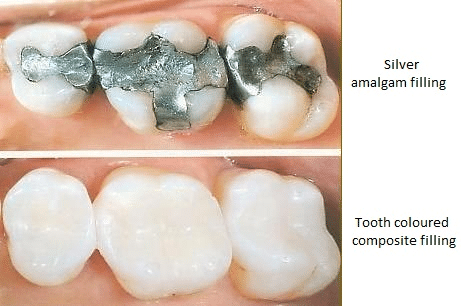 The material composite resin does not contain any metals like it’s predecessor amalgam. It has many tooth color shades’ making it nearly invisible in the appearance of your smile. Composite also bonds very tightly to the tooth, which makes it resilient to future cavities. If your tooth has a large cavity or crack/fracture frequently a filling is inadequate to restore/repair and seal the tooth. In these circumstances the only way to restore and save the tooth is from a crown restoration. A crown will restore the tooth in appearance and functionality and give additional strength to the tooth. Your crown is durable and lasting, as we use only the best materials in fabrication. If your tooth is symptomatic/painful from a large cavity, infection/abscess, fracture, or trauma then most probably the tooth will need a root canal. Root Canal(Endodontic) treatment removes the nerve from the tooth so it’s no longer symptomatic. If the tooth has a large cavity or infection, then the associated cavity and necrotic(infected) tissue is removed with the nerve. Normally, patients are placed on antibiotics after or even before a root canal to make sure all sources of bacteria are removed.